About six months ago, my friend Barb came over to share her ginger fascination with me. Barb grows ginger root regularly in her garden plot and never had to buy ginger from the market when prices skyrocketed to Rs 200/- a kilo this summer. I figured I could do that too, and possibly grow some turmeric alongside. Always curious about where exactly turmeric powder comes from (a wonder food that I add to almost everything I cook), this was the opportunity to get to the bottom of it – literally! So I toodled off to the market, got myself some fresh turmeric and ginger root, broke them into segments with one eye each, then chucked them under earth with the eye side facing upwards. After an agonizing wait of nearly three weeks (Did they die? Are they rotting below? Have they been munched up by ants?) 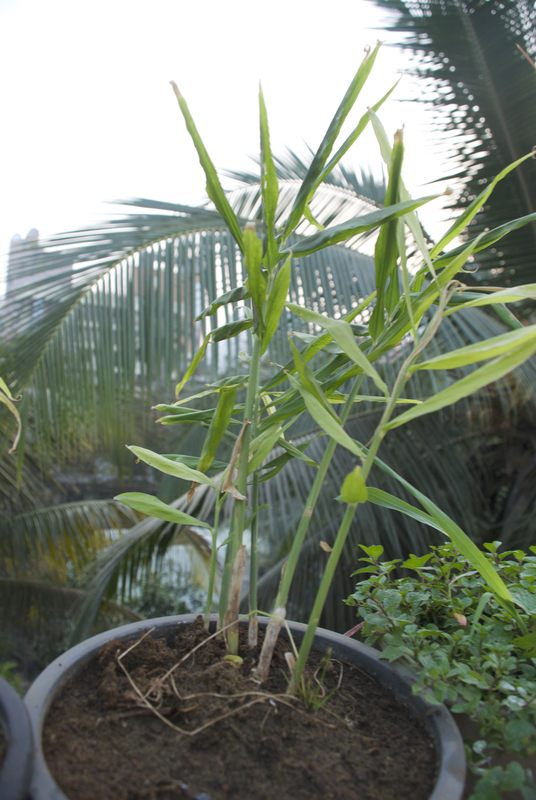 tiny saplings emerged – sharp, straight and absolutely wondrous! Hello world!…..and in six months…. 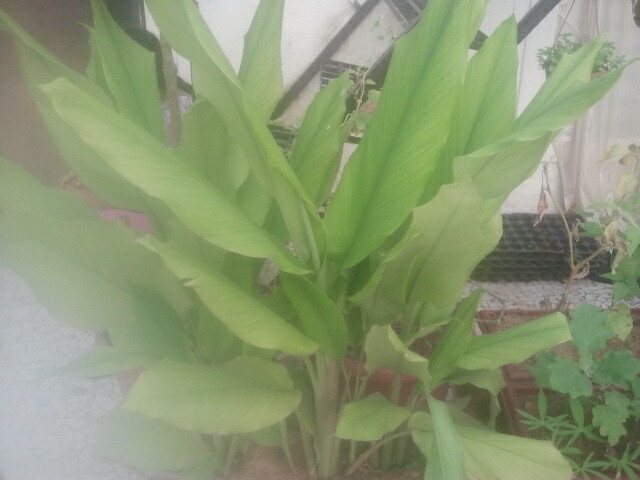 …and its oh-so-spiky counterpart – the ginger plant! Ginger and turmeric are easy to nurture – they need full sun, regular watering and almost no other care. With their strong aromas and antiseptic qualities, they remain free of weeds and harmful insects. You will know when your plants are ready to harvest, by the yellowing and eventual drooping of their leaves. When that happens, put on your gloves and get ready to dig out the golden goodness buried within! 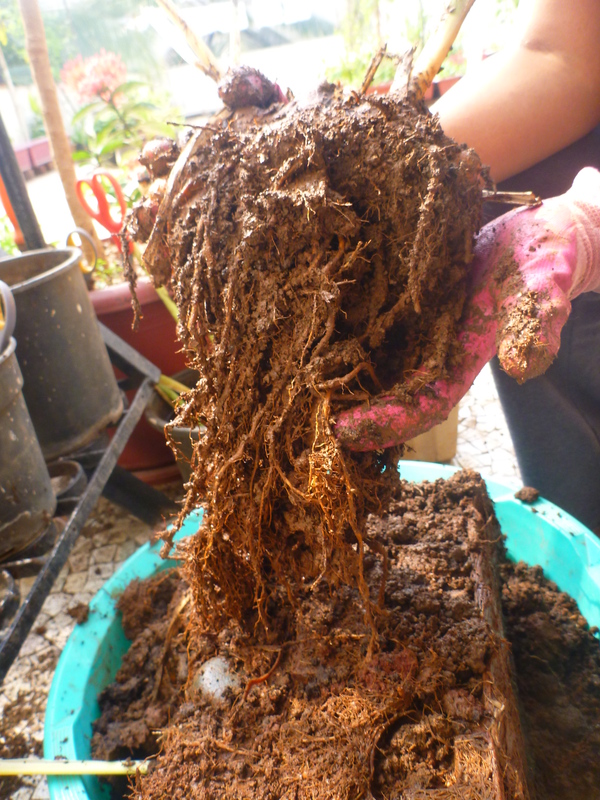 Playing with mud – upturning the turmeric pot to see what lies beneath! 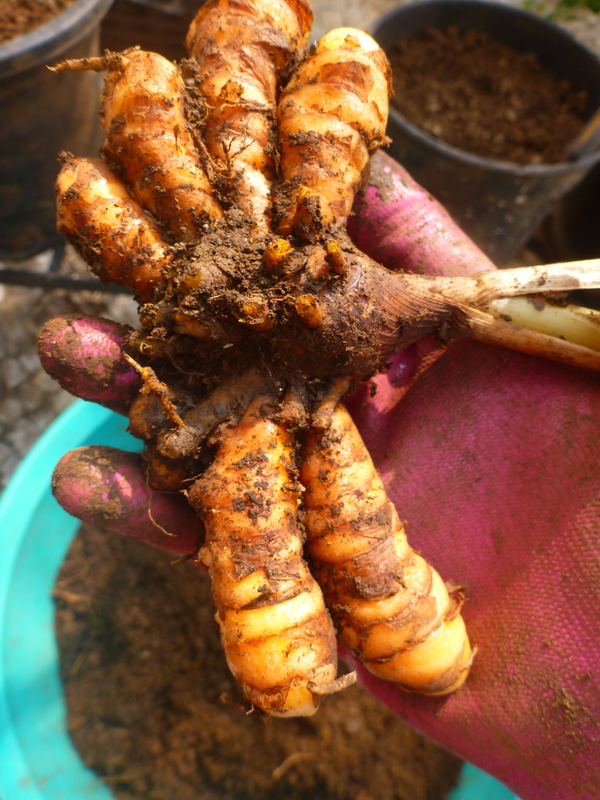 After the roots are trimmed…a handful of golden turmeric! And that’s how I learned where turmeric powder comes from! 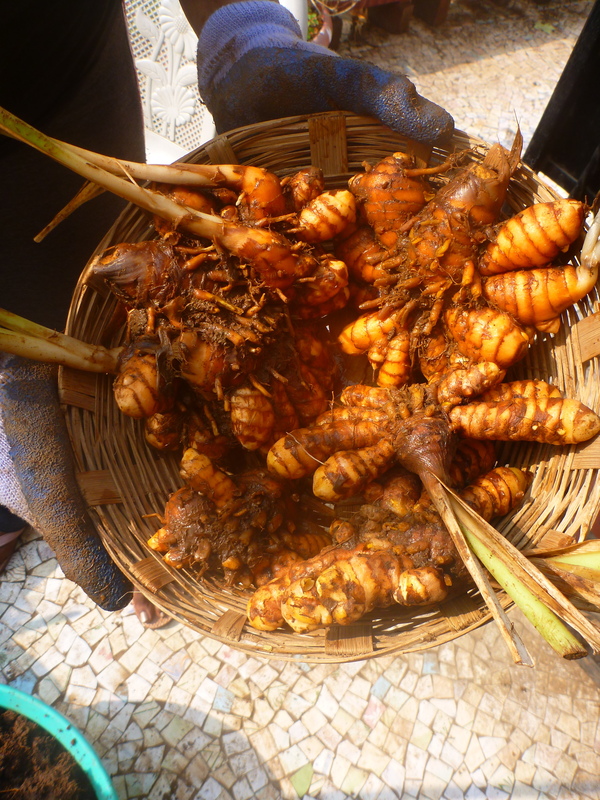 I harvested about three kilos of turmeric from six plants, and about one kilo of ginger from two plants (I simply forgot to take photographs of the ginger process, so you may need to wait six months for the next harvest!) The ginger was washed and pulped with garlic for paste, and awaits further cooking orders in my refrigerator. The turmeric, all nice and clean and scrubbed, is lying on my kitchen counter, waiting for me to finish this blog post and transform it into turmeric pickle. Until the next post, and next round of discoveries of what lies beneath, happy growing! © Mumbai Farmer 2014. Do not copy in part or whole without prior written permission from the author. Infringement of copyright will render you liable for legal action. 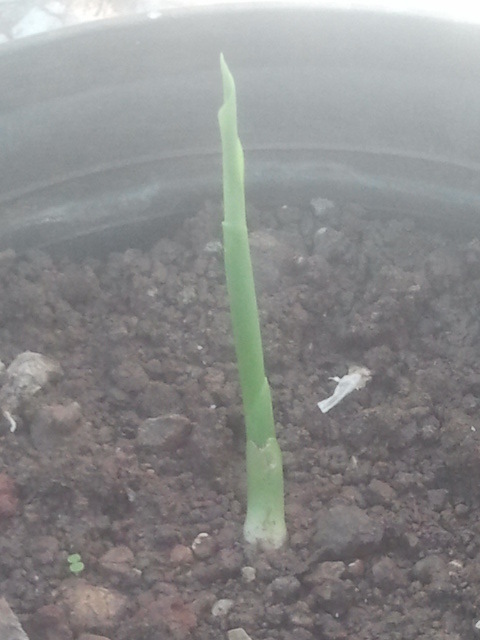 This entry was posted in agriculture, city, Container, Farming, Gardening, green, Hobby, lifestyle, Organic, root, Sustainable, Terrace, Tropical, urban and tagged agri, agriculture, agritech, consult, container, digging, eco, ecotech, farming, garden, gardening, ginger, green, grow own food, growing, herbs, hobby, kitchen garden, mumbai, organic, plants, project, roots, sustainable, terrace, turmeric, urban, urban farming, vegetables, veggies on February 26, 2014 by Mandy. Have any objections about me publishing this on my twitter? Sure, not a problem. Thanks for asking!